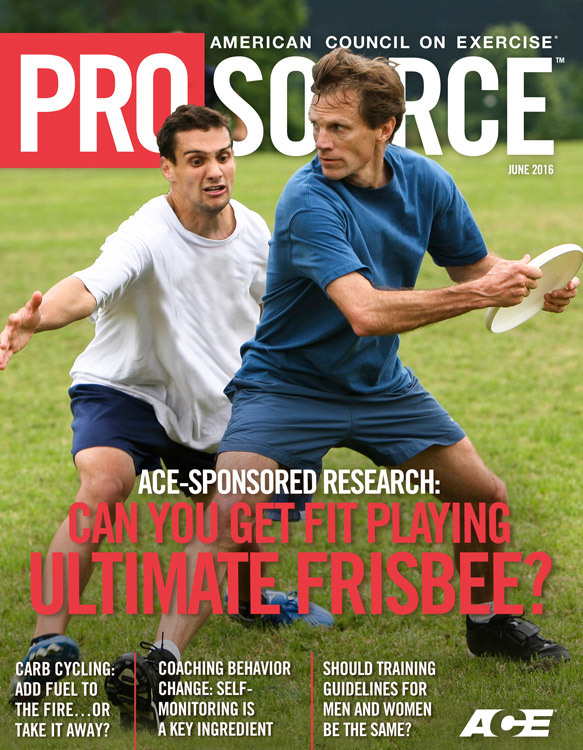 ACE - ProSource™: June 2016 - ACE-SPONSORED RESEARCH: Can You Get Fit Playing Ultimate Frisbee? 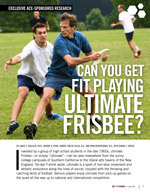 ACE-SPONSORED RESEARCH: Can You Get Fit Playing Ultimate Frisbee? Carb Cycling: Add Fuel to the Fire…or Take it Away? Battle of the Sexes: Should Training Guidelines for Men and Women Be the Same? Invented by a group of high school students in the late 1960s, ultimate Frisbee—or simply “ultimate”—can be seen everywhere from the sunny college campuses of Southern California to the liberal arts havens of the New England. Tie-dye T-shirts aside, ultimate is a sport of non-stop movement and athletic endurance along the lines of soccer, coupled with the throwing and catching skills of football. Serious players enjoy ultimate from pick-up games on the quad all the way up to national and international competition. Ultimate involves two teams whose players attempt to toss a Frisbee to one another until they cross the opponent’s goal line. Possession changes hands when the Frisbee is intercepted, touches the ground or goes out of bounds. A game consists of four 10-minute quarters. To learn the rules of ultimate and discover where you can play locally, visit www.usaultimate.org. The athletic skills involved in ultimate, in addition to the endurance and throwing and catching skills, include agility, speed, coordination and rapid transitions from offense to defense and back again. It is undoubtedly a serious sport featuring impressive levels of athleticism, but does participation yield cardiovascular and metabolic responses that would meet current guidelines for improving and maintaining cardiorespiratory fitness? ACE enlisted the help of Lance Dalleck, Ph.D., and his team of researchers in the Recreation, Exercise, and Sport Science Department at Western State Colorado University to find out. 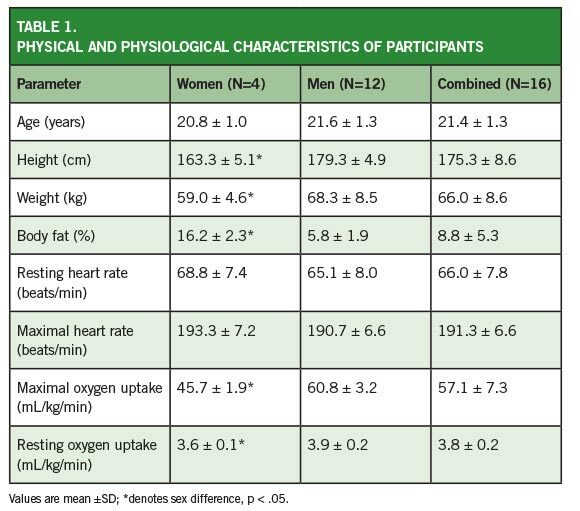 Researchers recruited 16 healthy and physically active young adults between 18 to 25 years of age (Table 1). Day 1 of the study consisted of the collection of each person’s physical and physiological measures, as well as measurement of resting metabolic rate and a maximal graded exercise test. Day 2 (which actually took place two to 20 days after day 1) consisted of an assessment of the cardiovascular and metabolic responses to an ultimate Frisbee match using a calorimetric measurement system, a heart-rate monitor and a GPS unit to record distance traveled (Figure 1). 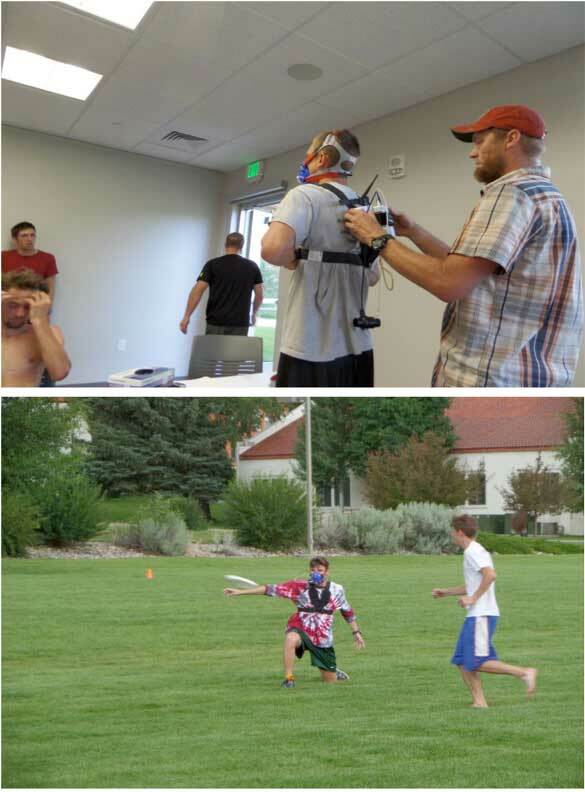 Figure 1 – The Oxycon Mobile metabolic system attached to a participant before (upper) and during (lower) an ultimate match. Study participants played a series of eight ultimate matches lasting 40 minutes each. Each participant had his or her cardiovascular and metabolic responses assessed during one half of the match, and the results were then extrapolated to account for a full match. In addition, peak blood pressure was measured in all participants at the end of the match and then every 30 minutes for 90 minutes post-exercise. 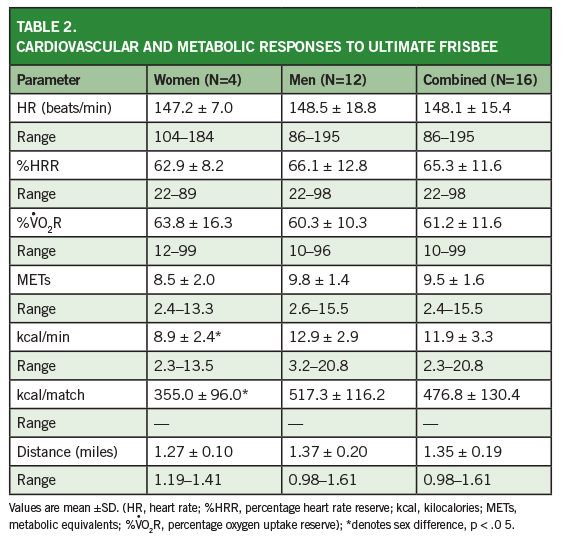 The responses to the ultimate match are presented in Table 2, while Figure 1 illustrates the exercise intensity in terms of heart-rate reserve for a representative participant throughout the duration of the ultimate Frisbee match. Figure 2. 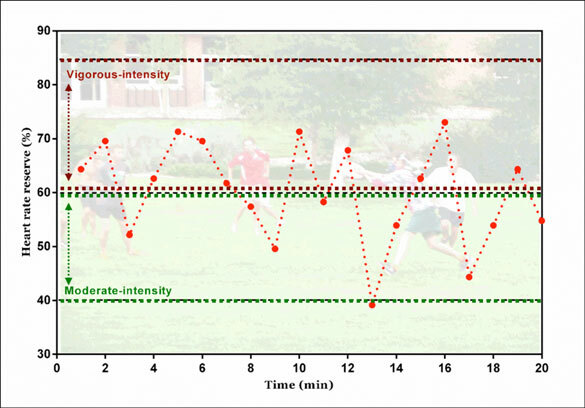 Exercise intensity in terms of heart-rate reserve (HRR) for a representative participant throughout the duration of the simulated ultimate match. The lower region (denoted by dashed green lines) represents the moderate exercise intensity classification, while the upper region (denoted by dashed red lines) represents the vigorous exercise intensity classification. The main finding of this study is that participation in an ultimate match elicits cardiovascular and metabolic responses in young adults that fulfill exercise intensity guidelines for improving and maintaining cardiorespiratory fitness. 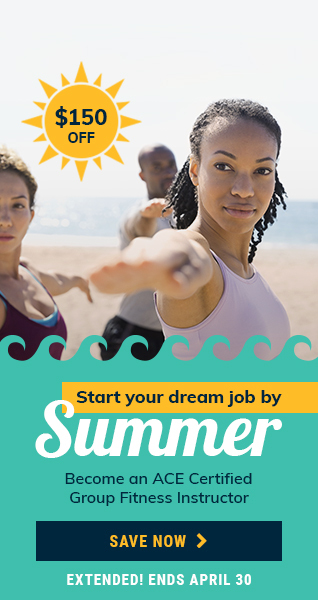 These guidelines state that individuals should accumulate 30 minutes of moderate-intensity aerobic exercise on five days each week or 25 minutes of vigorous-intensity aerobic exercise three days each week, or a combination of the two (U.S. Department of Health and Human Services, 2008). In this study, post-match systolic blood pressure (SBP) showed a significant decrease compared to pre-match values: –5.6 ± 5.1 mmHg, –8.6 ± 5.0 mmHg and –8.7 ± 5.7 mmHg at 30, 60 and 90 minutes post-match, respectively. These numbers indicate a greater decrease in SBP than is typically seen following an acute bout of moderate-intensity exercise (American College of Sports Medicine, 2004). While it has been established that a single bout of exercise at this intensity can lower SBP, Dr. Dalleck points out that simply being outside can also help to decrease SBP (Park et al., 2010). It is possible that a synergistic effect exists when the two are combined during outdoor exercise. Mean exercise intensity of the study participants was 65.3 percent of heart-rate reserve, 61.2 percent of VO2reserve and 9.5 metabolic equivalents. These values, depicted in Table 1, are in line with moderate-to-vigorous intensity exercise above that seen with running at 5 miles per hour. Combine this with an overall energy expenditure of approximately 477 kcal per match and it is clear that ultimate is an ideal exercise modality to meet a target of 400 kilocalories burned through exercise each day (American College of Sports Medicine, 2014). Dr. Dalleck also points out that the varying intensity level that can be seen in Figure 1 is similar to what is experienced in interval-based workouts, as the players perform all-out sprints, followed by jogging back to get into defensive position followed by another sprint to make a play. This self-selected intensity can vary according to the flow of the game and the individual player’s competitive spirit. One of the most commonly overlooked elements of a fitness program that drives long-term adherence is the fun factor, and ultimate certainly provides more than its fair share of fun. As Dr. Dalleck points out, “participants don’t need a high degree of skill to have fun while playing ultimate.” Health and fitness professionals and their clients would benefit from the promotion of fitness through play that prevents boredom and elicits meaningful physiological responses in terms of heart rate and energy expenditure—and ultimate Frisbee hits the mark on all counts. Dr. Dalleck reports that the study participants were surprised by the fact that they burned an average of 477 calories during a 40-minute match, which is a great sign that they were enjoying themselves while working hard. And isn’t that the ultimate goal? American College of Sports Medicine (2014). ACSM’s Guidelines for Exercise Testing and Prescription (9th ed.). Philadelphia: Wolters Kluwer/Lippincott Williams & Wilkins. American College of Sports Medicine (2004). Position stand: Exercise and hypertension. Medicine and Science in Sports and Exercise, 36, 533-553. Park, B.J. et al. (2010). The physiological effects of Shinrin-yoku (taking in the forest atmosphere and forest breathing): Evidence from field experiments in 24 forests across Japan. Environmental Health and Preventive Medicine, 14, 18-26. 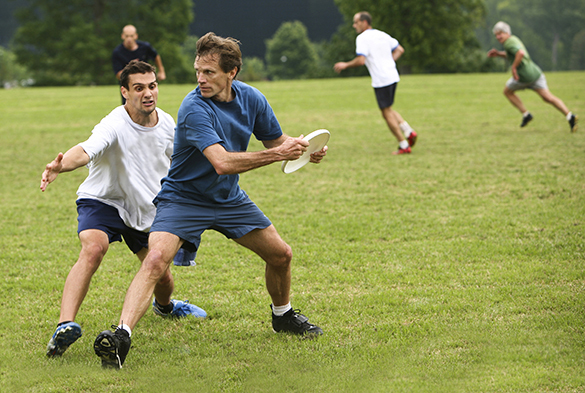 Study results suggest that participants burned an average of _____________ kilocalories per ultimate Frisbee match. 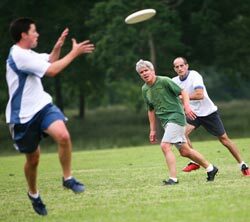 Participants showed a significant decrease in systolic blood pressure after playing an ultimate Frisbee match. Researchers believe that a synergistic effect exists between the physical activity and __________________.